Welcome to Day #10 of Chocolate and Nuts Theme Week. 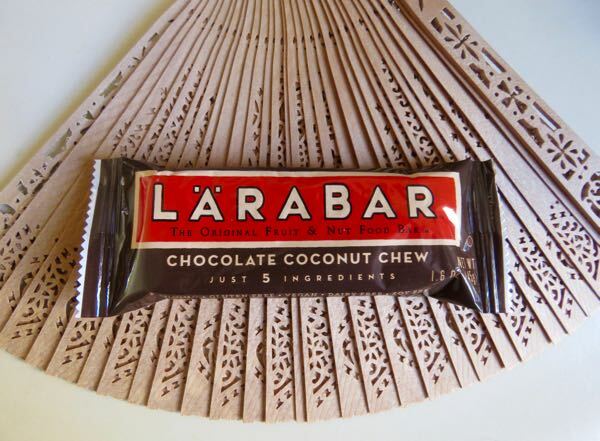 Today's Larabar Chocolate Coconut Chew bar was distributed by Small Planet Foods, Inc. (Minneapolis, MN). 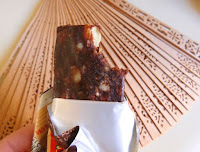 The bar was part of a line of Larabar fruit and nut bars. This 5-ingredient, compressed bar was quite sweet. The first ingredient listed was "dates;" and dates do have a certain concentrated fruity intensity to them. But, those that like dates, or prefer fruit and fiber over sugar, may applaud this choice. 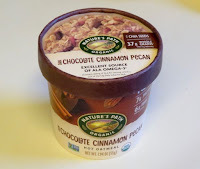 The remaining four ingredients were: almonds, walnuts, unsweetened cocoa powder, and unsweetened coconut. Welcome to Day #9 of Chocolate and Nuts Theme Week. 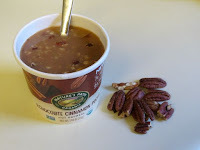 Today's Dark Cinnamon Pecan Hot Oatmeal was from Nature's Path Foods Inc. (Blaine, WA). Hot oatmeal is a good, hearty cereal for breakfast. * Pecan pieces gave this hot cereal an even more robust and slightly chewy, soft crunchy texture. The fair trade dark chocolate chunks melted with the addition of hot water, and contributed background cocoa flavor and color. A small handful of pecans we happened to have on hand amped up the nut flavor and texture. *Most items on Chocolate Banquet are sampled in the morning, and sometimes re-sampled later in the day.